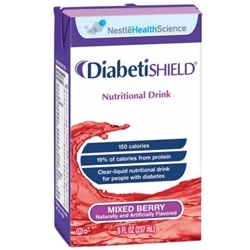 Diabetishield® is the first clear liquid supplement formulated for individuals with diabetes. Diabetishield® provides added arginine, chromium and vitamins C and E to help improve insulin sensitivity and aid in blood sugar control. * Use under medical supervision. This is a high nitrogen and high phosphorus product that may not be appropriate for individuals with kidney problems. Ingredients: Water, hydrolyzed cornstarch, whey protein isolate, L-arginine, phosphoric acid, citric acid, natural and artificial flavor, malic acid, L-cysteine, sucralose, FD&C Red No. 40 (artificial color). 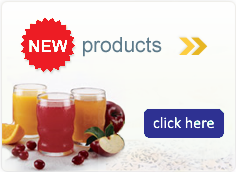 Vitamins and minerals: Ascorbic acid, alpha tocopheryl acetate, zinc sulfate, ferrous sulfate, niacinamide, calcium pantothenate, copper gluconate, vitamin A palmitate, manganese sulfate, pyridoxine hydrochloride, thiamine hydrochloride, riboflavin, chromic acetate, folic acid, biotin, potassium iodide, phytonadione (vitamin K1), cholecalciferol (vitamin D3), cyanocobalamin (vitamin B12).